"Ursinus College / Collegeville, Pa."
Ursinus College / Collegeville, Pa. This ca. 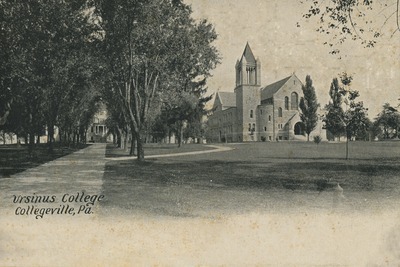 1905 postcard shows a view of the Avenue, Freeland Hall, and Bomberger Memorial Hall from Main Street. This image is presented for educational purposes only and is not for commercial use.